On February 24, 2019, Spanish Prime Minister Pedro Sánchez laid a wreath on the tomb of Manuel Azaña, the most important political figure of the Second Republic who had died in exile and was buried in France. He was the first Spanish leader since the restoration of democracy in 1978 to do so. In his remarks, and his tweet, Sánchez asked all Republican exiles for forgiveness for it having taken so long. “Many years have passed since you had to leave. But today, although very late, Spain pays homage to Manuel Azaña, to our fellow citizens of the exile. From the cemetery of Montauban, the eternal fatherland says to its children: Peace, Pity and Pardon”. Sánchez’s gesture, which coincided with the start of the campaign for national elections at the end of April, earned him a powerful rebuke from the leader of the opposition and the Spanish right in general. This is a small incident, but it is symptomatic of the way in which the memory of the Spanish Civil War (1936-1939) and the Franco dictatorship (1939-1975) that emerged out of it remains hugely contentious and informs – even poisons – political debate in the country. Sánchez, who came to power at the head of minority left-leaning government following a vote of non-confidence in the scandal-ridden conservative government of Mariano Rajoy in June 2018, has been at the centre of a much larger and more controversial conflict over memory. One of his first acts as prime minister was to announce that the remains of Francisco Franco would be removed from the Valley of the Fallen, the pharaonic monument just outside Madrid that the dictator had had built, in part by political prisoners, as his resting place and as a monument to the triumph of his vision of Spain. (The Valley of the Fallen is supposed to house the remains of people who died during the conflict so, even on its own terms, Franco does not belong.) What might appear to be simple matter has turned out to be anything but. Opposition from the Catholic Church, the Franco family, and the political right has meant that, nine months later, Franco’s tomb remained in its place of honour at the foot of the altar in the giant basilica, although in March the government said it will be removed by June 10. Franco’s is only one grave, however symbolic. More significant still are the thousands of people who were killed during the Civil War and whose remains continue to lie in unmarked mass graves across the country. This was one of the issues addressed by the 2007 “Law of Historical Memory”. This law condemned the Franco regime, ordered the removal of Francoist symbols from public spaces, provided economic compensation to victims of Francoism and their descendants, prohibited political demonstrations at the Valley of the Fallen, and granted honorary Spanish citizenship to the surviving members of the International Brigades as well as to the children and grandchildren of exiles. In addition the law provided assistance in locating and exhuming mass graves. It did not, however, commit the national government to itself taking the initiative in identifying and exhuming mass graves. The law was fiercely resisted by the then right-wing opposition, which charged the Socialist government with “bringing division and confrontation, and reopening the wounds of the past.” When the PP came to power in 2008, it effectively killed the law by refusing to assign any budget to its activities. A new, and threatening, political use of the past has emerged recently. In the December 2018 elections in Andalucía, the largest of Spain’s seventeen “autonomous communities”, the new far-right party Vox won 11 per cent of the vote and enough deputies to hold the balance of power. This was the first time since the death of Franco that a party of the extreme right has had a presence in a legislature in Spain. 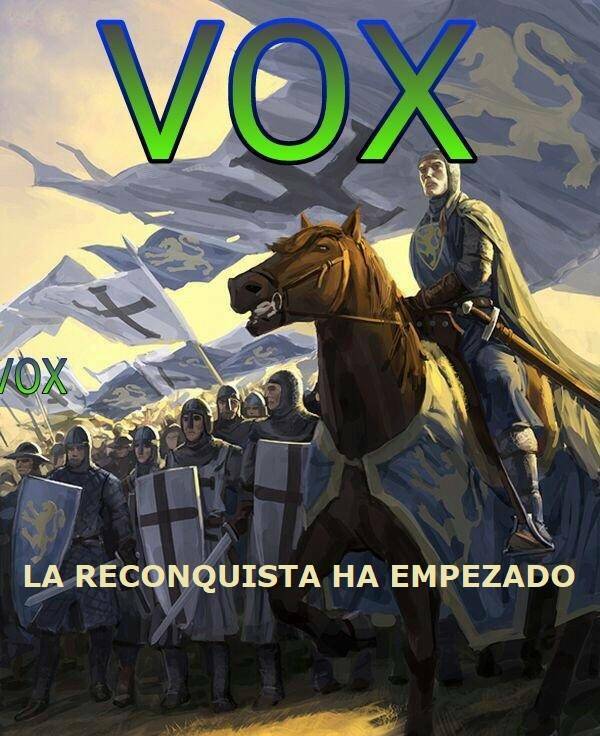 In its campaign, Vox reached into the country’s medieval past, calling for a new “Reconquest”. This invocation of the supposed 781-year struggle (711-1492) by Christians to drive the Muslims from Spain is unsurprising in an explicitly anti-immigrant party, but it also mobilizes a powerful master narrative of national unity that takes direct aim at Catalan separatism, and even at the quasi-federal state structure embodied in the Constitution of 1978. Since the election, Vox has demanded that the previous Socialist government’s 2017 Law of Historical Memory, which established the obligation of the regional government to compensate the victims of Francoism, be replaced by a “Law of Concord” that would eliminate what it considers a “sectarian rewriting of history”. Image obtained from: El Manifiesto. Periódico política y socialmente incorrecto, “Y España empieza a amanecer…”, 3 December 2018. Similarly, the politics of historical memory have played an important supporting role in Catalonia’s recent mobilization for self-determination. In December 2013 the symposium Espanya contra Catalunya: una mirada història (1714-2014) [Spain against Catalonia: a historical perspective (1714-2014]), organized by the Institute of Catalan Studies in Barcelona, commemorated the three hundredth anniversary of the fall of the city to the troops of Philip V during the War of the Spanish Succession. It promoted the view that Catalonia has been historically repressed by the rest of Spain. It analysed the continuous military, political, institutional and cultural “repression” that the northwestern region has gone through since the 18th century. The tricentenari also included BCN 1714: Un passeig sonor per la història [Barcelona 1714: a sonorous ride through history], a mobile app to guide tourists through the most emblematic spots of 1714 Barcelona. The view of the Spanish central government as historically authoritarian and centralist has fuelled the Catalan separatist movement from the start, with abundant references to General Francisco Franco and the repression of Catalan culture under his regime. (There is also the claim, rejected by mainstream historiography, that the Civil War represented a “Spanish invasion” of Catalonia.) This discourse paved the way for Carles Puigdemont, former president of Catalonia, to advocate for Catalan independence and to carry out a unilateral referendum on the matter. The Spanish government answered the call with open opposition, which included the invocation of the never-before-used Article 155 of the constitution to depose the Generalitat, the government of Catalonia, and order the arrest of the people responsible for it. In open defiance, in October 2017 the illegal referendum on independence took place. On February 12, 2019, Spain’s ‘trial of the century’ got underway in the Supreme Court in Madrid. The leaders of two civil society organizations and ten politicians, including Oriol Junqueras, the former vice-president of the Generalitat are in the dock facing charges of rebellion, disobedience and misuse of public funds which could bring prison sentences of up to thirty years. Many had already spent fifteen months in preventative detention. Not in the courtroom, but at the very heart of the events in question, was Puigdemont, who had fled from Spain to Belgium to escape arrest. The entire political situation in Spain is in flux and the outcome of the national election scheduled for April 28 is far from clear. It is even possible that Vox will hold the balance of power in a severely fragmented parliament. (The outcome of the trial will have a significant impact, even though the verdict is not expected until the early autumn of 2019.) At the same time, the secessionist parties in Catalonia are at each other’s throats in a vicious fight for dominance. In the midst of all this uncertainty, it is a safe bet that left and right, Catalan secessionists and Spanish nationalists will continue to wield history and historical memory as political weapons. Like many European countries, with the notable exception of Germany, Spain has not yet come to terms with the horrors of its recent past. Since the death of Franco, there have been only limited efforts to create a historical memory that transcends Francoism’s division of Spaniards into “victors” and “vanquished”, incorporates what historians have discovered about the Civil War and the regime that emerged from it, and accords basic human dignity to the victims of both. Promoted by the left, these efforts, including Sánchez’s recent remarks, have been vilified by right-wing politicians. 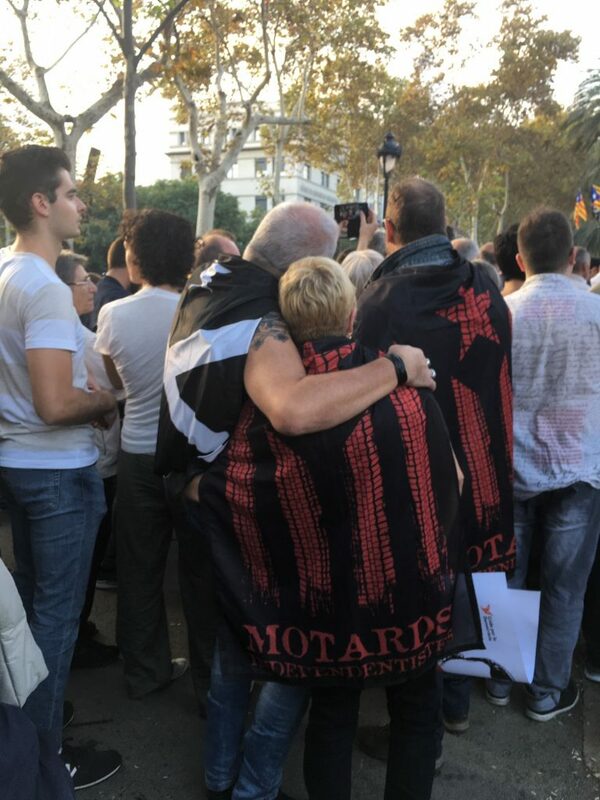 These people have very little in common with Catalan secessionists, but if there is one thing they do share, and about which they are equally enthusiastic, it is the twisting of the past to serve their political ambitions for the future. Bàrbara Molas is a PhD student in the History Department at York University. Adrian Shubert is University Professor of History at York University.